This forward-thinking statement from Sudhakar Ramakrishna, CEO at Pulse Secure, complements recent research reports that place enterprise security and access hand-in-hand with user experience and enterprise productivity. Pulse Secure represents a new breed of security company, that focuses entirely on the rapidly growing Secure Access market. 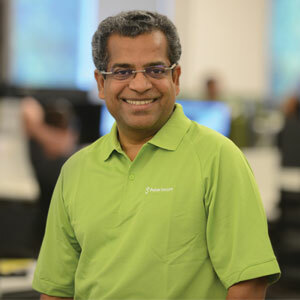 Ramakrishna is an IT veteran with more than two decades of experience in the security, mobility, cloud, networking, and collaboration markets. According to him, “security complexity”—the various disparate layers of security controls, policies, client and mobile applications, and even logins required within an enterprise is encumbering the pursuit of improved security solutions and therefore user and administrator productivity. This focus is what drives Pulse Secure –to deliver Secure Access for the next generation workforce. “At Pulse Secure, our mission is to provide a single platform that delivers secure access for people, devices, things, and services,” states Ramakrishna. Ramakrishna highlights that the entire “Pulse Nation,” as he calls it, is oriented towards “customer success”—a spirit, and a set of behaviors, that permeates throughout the organization to do whatever is necessary, and whatever it takes, to ensure success of their customers. Pulse Secure enjoys a very respectable Net Promoter Scores (NPS) of over 40 and is relentless with its service offerings and focus on customer success, Ramakrishna adds. New technologies and changes in worldwide regulations and economics are drastically transforming the way in which business infrastructure is deployed and used in the modern enterprise. Employees want to be productive regardless of their location by accessing information without friction while administrators need simpler tools to secure their enterprise across ever expanding boundaries. Pulse Secure allows customers to easily and simply address these new application types, and deployment needs. Their value proposition is to enable secure productivity in any industry. “We have a role to play in almost every market sector as everyone wants their employees to securely access their data centers, information and applications, easily and without traditional complexity. After all, simpler solutions lead to greater productivity,” says Ramakrishna. Pulse Secure meets the security and productivity requirements of any organization with its Pulse Access Suite. The integrated solution allows policy based Secure Access to any corporate resource, from any device, to any corporate resource or application, without compromising security. The building blocks of the Pulse Secure platform include Pulse Connect Secure, Pulse Workspace, Pulse Profiler, Pulse Policy Secure, and Pulse One. Pulse Secure software runs on more than 18 million endpoints, including an increasing number of mobile and IoT endpoints, and supports the growing needs of the most demanding customers—spanning over 20,000 diverse companies including compliance and regulatory focused, distributed enterprises, healthcare, finance, and education. More than 80 percent of the Global Fortune 500 corporations leverage Pulse Secure solutions every single day. Pulse Connect Secure is an award winning, feature-rich SSL VPN solution that provides connectivity for a user, regardless of the device being used, to any corporate resource including cloud applications and corporate data centers. Features include clientless access, strong authentication, host checker, granular auditing, virtual desktop access, and MDM integration. Pulse’s Cloud Secure capability allows seamless and compliant access to SaaS applications, such as Office 365 and Salesforce.com. All major mobile device operating systems are supported, further enhancing the Secure Access from anywhere proposition. Increasingly, workers are bringing their personal devices into the work environment expecting access to business applications and data. Corporations are becoming cognizant of the fact that there can be additional risk with information housed on devices that they don’t have full ownership and visibility of, equally, corporations have to adapt to the changing user behaviors. Further, varying government regulations across the globe insist on specific data compliance and handling. The trick for corporations is to abide by complex and differing regulations without having to impact user experience and interpret government jurisdiction. Pulse Workspace delivers a secure mobile workspace, allowing enterprises to securely deliver corporate applications and data to personal devices. The solution separates personal and professional environments on the device, catering to needs for security and great user experiences, while not affecting personal data on the device. Ramakrishna says, “Inconsistencies and fragmentation within disparate data sources create security loopholes in enterprises. Pulse Workspace consolidates, simplifies, and manages resources in an enterprise, while respecting BYOD boundaries.” Pulse Workspace provides the right amount of control to IT without invading the employee’s privacy. Recent ransomware attacks have focused administrators on the security of internal networks. WannaCry’s deviousness comes from its ability to self-propagate without any action from the end user. Thousands of work hours and dollars could have been saved by ensuring all endpoints were updated with the latest patches. The threats here are the non-compliant, unpatched devices that are still allowed on corporate networks. Shadow IT is a serious problem, where businesses don’t know who or what is connecting to their network, or what data is coming in and out. Pulse Secure has recognized these changing requirements on enterprise networks. “Enterprise Networks were once walled gardens and monolithic. We used to only worry about outside and inside or untrusted and trusted. Those days are long gone, but surprisingly we see many customers only now starting to consider the risks of this binary classification as more and more connected devices are attached to trusted network environments,” Ramakrishna adds. Pulse Policy Secure offers complete network access control of ‘what, when, where, and who’ connects to a company’s network with features like BYOD onboarding, granular auditing and logging, guest access management, and more. With Pulse Policy Secure you can set policies on which devices connect to your network and what they can do once they are connected. For example, you can perform compliance auto-checks, also known as Host Checkers, on all devices connecting to ensure that the endpoints are running the latest patches and/or antivirus, and if not, automatically remediate and apply the patches. With Pulse Policy Secure, you can also quarantine or provide limited access until the end user ensures the device is compliant, enabling an effective patch management system that proves resiliency against the threat of Shadow IT. Pulse Secure’s new network profiling solution, Pulse Profiler, provides IT the visibility of every device on their network to make informed, policy based decisions about potential threats. Pulse Policy Secure along with the Profiler and Pulse’s unified client software form the basis of a complete IoT solution. "We are even enabling connected cars to be secure"
As Pulse Secure strives to delight users as well as the system administrators who manage IT, considerable time is spent innovating on productivity enhancing features. One area that is typically ignored by other enterprise software vendors is that of consolidated management and monitoring. Pulse One, Pulse’s management platform allows IT administrators to leverage a single centralized console for end-to-end visibility from endpoints to appliances. Managing access no longer involves working with multiple management consoles and techniques from multiple vendors. Pulse One can be integrated with back-office systems such as Microsoft Active Directory. Deployed as Software-as-a- Service (SaaS) or on premise, it scales and introduces new features without the need for data center logistics and planning. The rationale for why 80 percent of the Fortune 50 companies and over 20,000 customers rely on Pulse Secure to make their workforce more productive is crystal clear. Take the case of a leading global university that approached Pulse Secure for a solution to provide remote connectivity. The university then wanted to increase productivity and initiated a BYOD program for its students, enabling them to use their personal devices. The program brought in challenges of setting the right policy, delivering the right access, preventing network infection, and more. Consequently, the need of connectivity changed into a policy challenge. Stepping into the scene, Pulse Secure addressed the unique use case with the Pulse Access Suite, catering to the diverse needs of the client, eliminating the need for investment in multiple technologies, and delighting their end-users with an easy to use solution. In the days ahead, Pulse Secure aims at extending secure access into new growing markets, and recently announced the acquisition of Brocade’s virtual Application Delivery Controller (vADC) business. “This acquisition enables us to accelerate our secure access mission. Brocade’s vADC is a recognized leader in delivering simple user experiences for the administrator and has accelerated the Hybrid IT journey of numerous customers, large and small, throughout the world,” said Ramakrishna. As new innovative devices, things, and services enter the IT world, Pulse Secure continues to develop the security and productivity requirements needed to deliver Secure Access rather than just control. The excitement surrounding these growing markets opens the doors of opportunity for Pulse Secure to extend their Secure Access journey.